Create a whimsical party atmosphere with our Kiwi Green Paper Lanterns! These festive paper lanterns arrive flat but easily expand into round decorations with the included metal frames. Mix and match with themed or other solid color decorations to create a one-of-a-kind party atmosphere for birthdays, holidays, graduations and other events! Create a whimsical party atmosphere with our Kiwi Green Paper Lanterns! These festive paper lanterns arrive flat but easily expand into round decorations with the included metal frames. Mix and match with themed or other solid color decorations to create a one-of-a-kind party atmosphere for birthdays, holidays, graduations and other events! 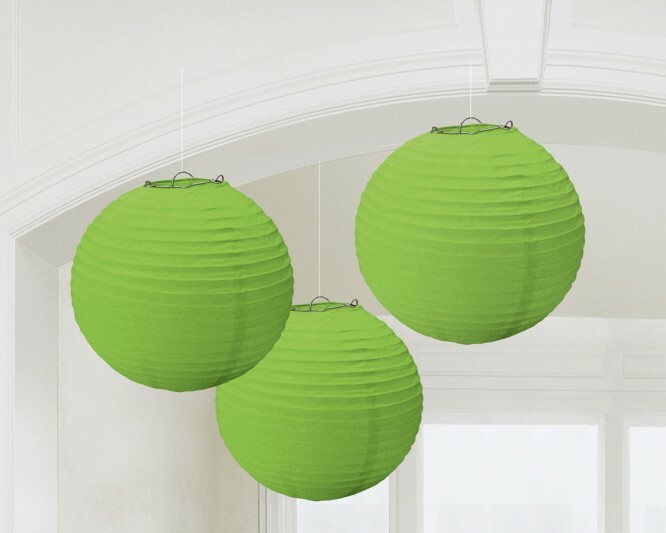 Kiwi Green Paper Lanterns product details: 24 cm wide, 3 per package, Includes strings for hanging. NOTE: Lanterns are for decorative purposes only. Do not hang over light bulbs or near open flames.